The Dodge Charger was first introduced in 1966 and quickly became one of the most popular muscle cars in history. Apart from a layoff between 1987 and 2006, the Dodge Charger has been going from strength to strength with the current model having the mighty Hellcat engine with 707hp. Below are facts you may or may not have known about the mighty muscle car from its inception. – 1964 saw the Dodge Charger concept vehicle based on the Dodge Polara. – 1965, was a optional package on the Dart GT called the Dodge Charger 273. – 1966 saw the official introduction of the Dodge Charger, based on the B platform and the Dodge Coronet with a base price of $3,122. The unique features included bucket seats, which folded in the front and the back. Engines varied from a 318cu. up to a 426cu. V8, with a A230 3-speed manual, A833 4-speed manual or TorqueFlite 3-speed automatic transmission. – 1968 saw the second-generation redesign of the Charger. A Coke bottle design was employed with a ‘kick up’ spoiler influenced by Group 7 racers. – 1969 was the year of the Dukes of Hazzard (1979–1985) Charger possibly the most iconic of the Charger designs. – 1969 saw the introduction of the Charger 500 and the Charger Daytona, very similar to the Plymouth Superbird in shape and design. Both were optimised for the NASCAR circuit but did not last more than a year. The Charger 500 came with a 426 Hemi according to Dodge literature, but was possibly a 440 Magnum. The same for the Charger Daytona. – 1970 saw a slight design change with a wraparound chrome bumper with no central division. Electric headlight doors replaced the old vacuum setup. 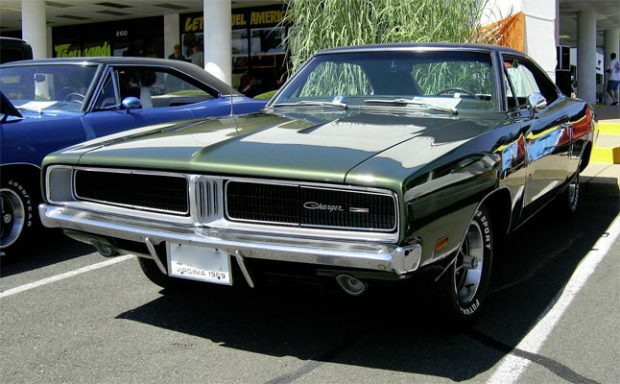 – 1971 was the introduction of the third-generation Dodge Charger with a split grille design and more rounded body. With minor changes the way, this design lasted up until 1975. The Dodge Charger design changed dramatically in 1975 and carried on up until 1987 when it was finally discontinued until 2006. Next Story → Is this 1968 Dodge Charger With a BMW M5 V8 Sacrilege?